Many types of retentive systems are used in removable partial dentures [1-3]. Also, several types of attachments are used with overdentures [4, 5]. One of those systems that may be used as retainers for partial dentures or as attachments for overdentures is the double crown system (or telescopic attachments). A telescope crown was patented in 1873 by Dr. J. B. Beers . Telescoped bridgework was reported in The American System of Dentistry 1887 and F. A. Peeso published in 1894 his system of removable bridgework which was supported by telescope crowns [7, 8]. Telescopic crowns are widely used in some European countries such as Germany and Sweden , and in the East of Asia. The term (telescopic denture) refers to the type of prosthesis that includes double crowns as retainers or attachments. These retainers (or attachments) consist of 2 crowns; primary or inner crown which is cemented to the abutment (Fig. 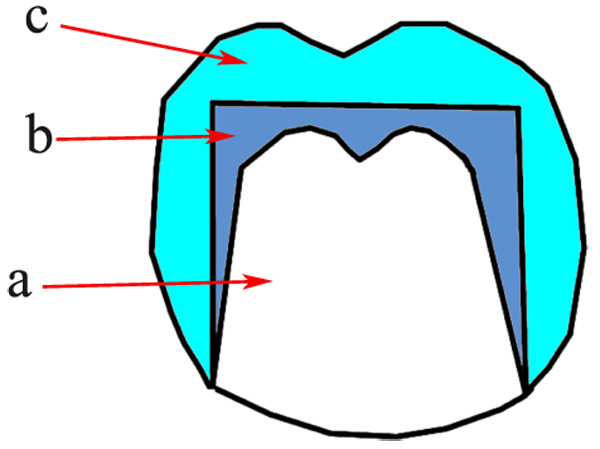 1), and secondary or outer crown which is attached to the denture (Fig. 2) [10-15]. 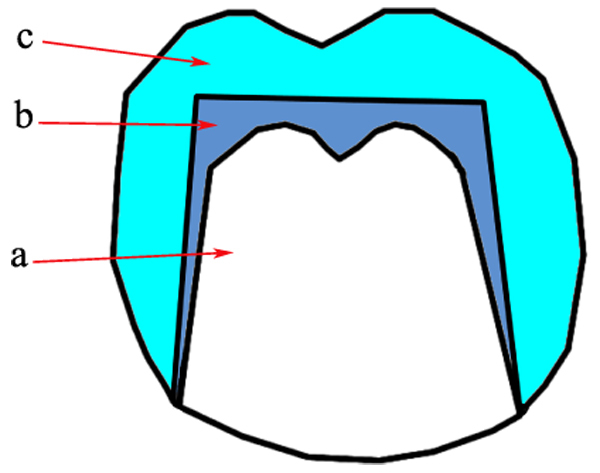 The external surface of the outer crown may have the anatomic shape of the natural tooth , or it may be as a simple coping without anatomic landmarks [8, 16]. Retention is achieved by the fitting of the outer crown on the inner crown [14, 17-20]. The purpose of this article was to give a clear idea of telescopic denture as an available choice of prosthodontic treatment. Fig. (1). Inner telescopic crowns. Fig. (2). Outer telescopic crowns attached into denture base. This type is the original form of telescopic crowns which is characterized by the parallel-sided inner crowns (Fig. 3) . Retention results from the friction between the inner and the outer crowns [20, 22]. This design was developed by Haupl and Böttger as mentioned by Langer and Behr [13, 23]. Fig. (3). Cylindrical telescopic crown: a- Prepared abutment, b- Inner crown, c- Outer crown. Cylindrical design has the advantages of great retention , and good esthetics in the marginal area . However, the fabrication of these crowns is very difficult because the perfect and accurate fit is required between the crowns . Moreover, as a result of the constant friction, the wear rate of the metal surfaces increases and a lever action occurs . Therefore, this type can be used only on abutments with sound supporting tissues when there is a need for much retention. This type is a modification of the previous system and was developed by K. H. Körber as mentioned by Langer, Hulten, Shiba, and Behr [9, 11, 13, 23]. The inner crown has a cone-like shape (Fig. 4) . So, the axial surfaces of it are tapered occlusally in a specific angle called the convergence angle (or taper) [20, 25]. Retention is obtained by the wedging action. The smaller the convergence angle the greater the retention force will be [10, 13, 22]. Fig. (4). Conical telescopic crown: a- Prepared abutment, b- Inner crown, c- Outer crown. A convergence angle of 6o is recommended. It results in a retention force of 5-10 N . Shiba mentioned that 4o-8o angle may be used according to the crown length and the physiologic movement of the abutment . Some authors recommended 2o angle to maintain accepted retention [20, 24, 25]. The conical type is used more widely than the cylindrical design because it is less difficult in fabrication , and less harmful to abutments and their supporting tissues [17, 20]. This design also has the advantage of determining the forces that would be applied to each abutment by selecting the convergence angle according to the clinical situation [12, 13]. However, the conical design has the disadvantage of retention decrease after a period of use [20, 24, 26]. They may be called the non-rigid designs, as they allow some freedom in the vertical and rotational movements between the inner and the outer crowns [12, 13, 27]. That may be achieved by some modifications in the inner crown, the outer crown, or both. These modifications result in reduction of the intimate contact and creation of a space between the inner and the outer crowns. Marburg double crown is a well-known resilient design [28, 29]. It is based on the clearance fit system where only the cervical third of the inner crown is parallel to the outer crown providing a space between the crowns. This space allows a minor lateral movement between the crowns and prevents stress occurrence [22, 28, 30]. In Hofmann and Ludwig design, the cervical half of the inner crown is parallel-sided while the occlusal half is conical with a space of 0.2-0.5 mm between the crowns in the occlusal region [12, 13, 27]. Yalisove introduced a conical design where the contact between crowns was limited to the 2 occlusal thirds, while there was a space of 0.003-0.010 inches between the crowns in the cervical third allowing the rotation of the outer crown and preventing the unfavorable friction . These designs provide resilient relation between the abutment and the denture, and according to their introducers and advocators they prevent the harmful effects, harmonize with tissues elasticity, result in better distribution of forces, and increase the survival rates of abutments. Resilient designs may be advantageous in the cases of a few remaining or weak abutments, and in distal extension situations. Studies showed that resilient design was successful when used in implant-supported dentures [32, 33]. Prefabricated telescopic attachments [13, 37, 38]. The great retentive force result from the fitting and extensive contact between the surfaces of the inner and the outer crowns [7, 8, 12, 25, 39-41]. This is due to the accurate relation between the inner and the outer crowns, as they are rigidly connected to the denture base [7, 10, 11, 37]. As the telescopic crowns surrounding abutments completely, so the occlusal forces are transmitted to abutments through their long axes [12, 39]. That can be easily provided by the parallelism of inner crowns even if the abutments are tilted [11, 37, 42]. The telescopic attachment provides accessibility to the gingival tissues of the abutment allowing effective home care and good oral hygiene. Moreover, the good fitting of the inner crown on the abutment protects it from caries and thermal irritation [11, 13]. Using double crowns as retentive elements allows better esthetics than clasps [11, 39]. Good esthetics can be provided by using ceramic faces and a suitable color selection. Many authors reported good patient satisfaction rates with telescopic dentures [7, 8, 10, 37, 41-44]. Telescopic dentures can be easily repaired even when an abutment is lost [11, 25, 37, 45]. Telescopic dentures fabrication requires very complicated clinical and laboratory procedures. That results in a long treatment period and increased cost [13, 42, 46]. It may be difficult to achieve the exact retention required between the 2 crowns. Moreover, the denture retention may be evaluated only after cementation of the crowns [14, 46]. Also, the retentive force between the crowns decreases after a period of use. That results from the repeated insertion and removal of the denture and the wear of crowns metal [24, 26, 47, 48]. The failure in providing the accurate fit of the crowns or the poor oral hygiene may lead to the occurrence of cervical caries [9, 25]. Esthetic problems and difficulties may arise such as the show of crowns metal, or the overcontouring of the crowns [11, 42, 46]. Technical failure is one of the primary problems associated with telescopic denture. Many studies reported high rates of technical failures in this type of prostheses [21, 23, 25, 43, 46, 49]. Technical failures may be loss of cementation, loss of facings, or fracture of artificial teeth, the metal framework, or the denture base . Follow-up, periodic evaluation and maintenance are necessary to overcome the problems related to technical failures, cervical caries, and retention [21, 25, 50]. 1- Few remaining or unfavorably distributed abutment teeth [15, 25, 37, 44, 51]. 2- When the abutment teeth need to be covered by crowns because of extensive caries or poor contour [12, 39]. 3- Abutment teeth with guarded prognosis [7, 25, 46]. 4- Advanced periodontitis cases [10, 52, 53]. 5- When it is difficult to find a suitable path of insertion as in the case of unparallel abutment teeth [17, 37, 42]. 6- Oral cancer patients [54, 55]. 7- Connecting natural teeth to implants . 8- Occlusal reconstruction cases . 9- Patients with poor manual dexterity [22, 33, 54]. Telescopic prostheses are widely used in clinical situations. They are not limited to a single type or design as there are several possibilities and patterns of the double crown and the telescopic denture . Telescopic crowns can be used as retainers for partial dentures instead of clasps and precision attachments. In this case, the prosthesis is called (telescopic partial denture) which is usually fabricated with metal framework [12, 39]. Also, telescopic crowns are indicated as attachments for overdentures. Then the prosthesis is called (the telescopic overdenture) which is indicated generally where there are a few remaining teeth. These overdentures may be fabricated with acrylic base [7, 8]. In addition to using them with natural teeth, telescopic dentures may be supported by implants [32, 33]. Moreover, telescopic dentures may be a good choice to connect implants to natural teeth . Many studies were done to investigate telescopic dentures. A large number of these studies evaluated the retentive force associated with this type of prostheses. That is expected as telescopic crowns are basically retentive elements. Arnold et al. compared the retentive forces of different designs of double crowns. They found that telescopic crowns with additional retention elements had the highest retention forces. Çelik Güven et al. analyzed the retention forces of double crowns with various fabrication methods and materials. They observed the best results when zirconia primary crown and electroformed secondary crown were used. Nakagawa et al. investigated the effect of telescopic crowns taper on the retentive force and found that the retentive force decreased when the taper increased. Wagner et al. evaluated the retention load of telescopic crowns. Polyetheretherketone (PEEK) crowns on cobalt-chromium primary crowns were used in their study. They concluded that telescopic crowns made of PEEK had stable retention load. Several studies evaluated the electroplated telescopic retainers with zirconia primary crowns. Schwindling et al. investigated the clinical outcomes of this type of telescopic denture and found favorable survival rate and good outcomes. Also, Schwindling et al. evaluated the effect of this type of telescopic denture on Oral Health Related Quality of Life (OHRQoL). They found that OHRQoL was improved. The effect of telescopic dentures on Oral Health Related Quality of Life (OHRQoL) was evaluated in other studies such as Elsyad and Mostafa study . They found that mandibular telescopic distal extension removable partial dentures were associated with improved oral health related quality of life. Some studies investigated the use of telescopic crown attachments in implant-supported dentures. Yunus et al. results showed that mandibular implant-supported overdentures retained with telescopic attachments improved OHRQoL, patient satisfaction, and masticatory performance. Also, peri-implant soft tissue response and implant stability were favorable. The telescopic denture is a unique type of prosthodontic treatment. Several designs of double crowns were developed. The selection of the design depends on the clinical situations and the dentist preference about using rigid or resilient type. Telescopic dentures have many advantages. However, They are associated with some disadvantages. Therefore, dentists should be careful during treatment planning and the following stages. They must thoroughly evaluate the expected advantages and disadvantages keeping in mind the higher cost and the long time needed for the fabrication of telescopic denture. When planning to provide a patient with a telescopic denture the dentist should inform the patient about the long period required for treatment and should give a clear explanation about the denture that would be delivered to the patient. All clinical and laboratory steps should be accurate. Sufficient reduction of tooth structure is necessary. Otherwise, over contouring is inevitable. Dental technician plays an important role in success or failure of telescopic denture. Only skilled well equipped technician can fabricate successful telescopic dentures. Several materials (and combinations of materials) were used for making telescopic crowns such as precious and non-precious metal alloys, zirconia, and PEEK. Further long-term studies are needed to evaluate the success of these materials and to develop new materials and designs of telescopic crowns. Telescopic denture should be kept in mind during treatment planning of cases requiring prosthodontic rehabilitation. It has many advantages and some disadvantages which must be evaluated carefully according to the clinical situation. The availability of various types of these dentures allows their use in a wide range of cases; especially those with a few remaining teeth or with specific complications. Further long-term research is still needed. Carr AB, Brown DT. McCracken’s removable partial prosthodontics 13th ed. 2015. Krol AJ. RPI (rest, proximal plate, I bar) clasp retainer and its modifications. Dent Clin North Am 1973; 17(4): 631-49. Hakkoum MA. New clasp assembly for distal extension removable partial dentures: The reverse RPA clasp. J Prosthodont 2016; 25(5): 411-3. Rutkunas V, Mizutani H, Takahashi H. Influence of attachment wear on retention of mandibular overdenture. J Oral Rehabil 2007; 34(1): 41-51. Carlsson GE. Implant and root supported overdentures: A literature review and some data on bone loss in edentulous jaws. J Adv Prosthodont 2014; 6(4): 245-52. Reitz PV, Weiner MG, Levin B. An overdenture survey: Preliminary report. J Prosthet Dent 1977; 37(3): 246-58. Schweitzer JM, Schweitzer RD, Schweitzer J. The telescoped complete denture: A research report at the clinical level. J Prosthet Dent 1971; 26(4): 357-72. Dhir RC. Clinical assessment of the overdenture therapy. J Indian Prosthodont Soc 2005; 5: 187-92. Hultén J, Tillström B, Nilner K. Long term clinical evaluation of conical crown retained dentures. Swed Dent J 1993; 17(6): 225-34. Langer Y, Langer A. Tooth-supported telescopic prostheses in compromised dentitions: A clinical report. J Prosthet Dent 2000; 84(2): 129-32. Shiba A. The conical double-crown telescopic removable periodontic prosthesis 1993. Langer A. Telescope retainers for removable partial dentures. J Prosthet Dent 1981; 45(1): 37-43. Langer A. Telescope retainers and their clinical application. J Prosthet Dent 1980; 44(5): 516-22. Stancić I, Jelenković A. 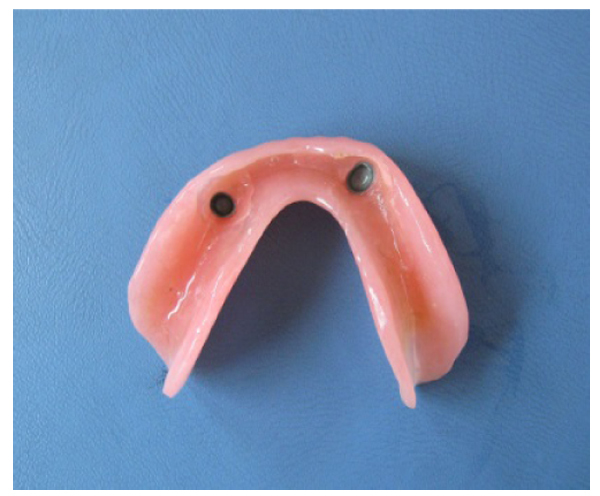 Retention of telescopic denture in elderly patients with maximum partially edentulous arch. Gerodontology 2008; 25(3): 162-7. Dabrowa T, Panek H, Napadlek P. 8-year clinical observation of telescopic anchors applied in removable dentures: Case report. Dent Med Probl 2007; 44: 521-5. Perel ML. Telescope dentures. J Prosthet Dent 1973; 29(21): 151-6. Güngör MA, Artunç C, Sonugelen M, Toparli M. The evaluation of the removal forces on the conus crowned telescopic prostheses with the finite element analysis (FEA). J Oral Rehabil 2002; 29(11): 1069-75. Kiyama M, Shiba A. Studies on retentive force of conical telescopic double-crown: Part 1. Retentive force of conical telescopic double-crown related to materials and taper angle and height of cone and load. J Jpn Prosthodont Soc 1994; 38: 1252-64. Sekiguchi Y, Kuroiwa A. Studies on pure titanium conical telescopic crown: Effect of changes in taper and height of inner crown on retentive force of outer crown made by cast-on technique. J Dent Mater 2003; 22: 271-82. Güngör MA, Artunç C, Sonugelen M. Parameters affecting retentive force of conus crowns. J Oral Rehabil 2004; 31(3): 271-7. Wöstmann B, Balkenhol M, Weber A, Ferger P, Rehmann P. Long-term analysis of telescopic crown retained removable partial dentures: survival and need for maintenance. J Dent 2007; 35(12): 939-45. Prakash V, Parkash H, Gupta R. Fixed removable prosthesis employing Marburg double crown system. J Indian Prosthodont Soc 2008; 8: 59-62. Behr M, Hofmann E, Rosentritt M, Lang R, Handel G. Technical failure rates of double crown-retained removable partial dentures. Clin Oral Investig 2000; 4(2): 87-90. Ohkawa S, Okane H, Nagasawa T, Tsuru H. Changes in retention of various telescope crown assemblies over long-term use. J Prosthet Dent 1990; 64(2): 153-8. Widbom T, Löfquist L, Widbom C, Söderfeldt B, Kronström M. Tooth-supported telescopic crown-retained dentures: An up to 9-year retrospective clinical follow-up study. Int J Prosthodont 2004; 17(1): 29-34. Minagi S, Natsuaki N, Nishigawa G, Sato T. New telescopic crown design for removable partial dentures. J Prosthet Dent 1999; 81(6): 684-8. Taha A, Elgheriani W, Idris B. 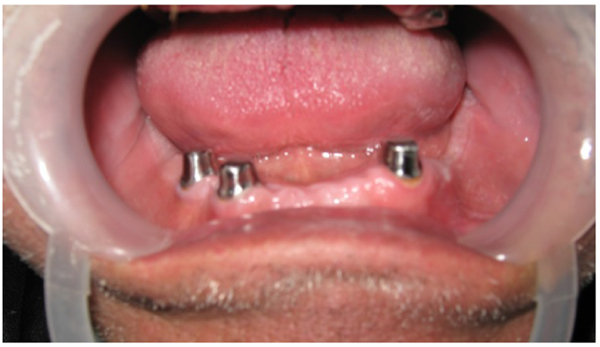 Rigid versus resilient telescopic retainers in distal extension removable partial overdentures. Cairo Dent J 2004; 20: 493-7. Wenz HJ, Lehmann KM. A telescopic crown concept for the restoration of the partially edentulous arch: The Marburg double crown system. Int J Prosthodont 1998; 11(6): 541-50. Kazokoğlu FŞ, Akaltan F. Strain characteristics of Marburg double crown-retained implant overdentures compared with bar and ball-retained implant overdentures, with and without a rigid major connector. J Prosthet Dent 2014; 112(6): 1416-24. Wenz HJ, Hertrampf K, Lehmann KM. Clinical longevity of removable partial dentures retained by telescopic crowns: Outcome of the double crown with clearance fit. Int J Prosthodont 2001; 14(3): 207-13. Yalisove IL. Crown and sleeve-coping retainers for removable partial prosthesis. J Prosthet Dent 1966; 16(6): 1069-85. Krennmair G, Weinländer M, Krainhöfner M, Piehslinger E. Implant-supported mandibular overdentures retained with ball or telescopic crown attachments: A 3-year prospective study. Int J Prosthodont 2006; 19(2): 164-70. Heckmann SM, Schrott A, Graef F, Wichmann MG, Weber HP. Mandibular two-implant telescopic overdentures. Clin Oral Implants Res 2004; 15(5): 560-9. Makihara E, Masumi S, Arita M, Yagi M. Clinical application of removable bridge prosthese with magnotelescopic crown. JJ Mag Dent 2008; 17: 50-3. Kumano H, Nakamura Y, Masuda T, et al. A case report of prosthesis using the magno-telescopic crown. J Mag Dent 2012; 21: 70-4. Lee MW, Baum L, Pence B Sr, Hererra W. O-ring coping attachments for removable partial dentures. J Prosthet Dent 1995; 74(3): 235-41. Langer A. Tooth-supported telescope restorations. J Prosthet Dent 1981; 45(5): 515-20. Langer A. Combinations of diverse retainers in removable partial dentures. J Prosthet Dent 1978; 40(4): 378-84. Isaacson GO. Telescope crown retainers for removable partial dentures. J Prosthet Dent 1969; 22(4): 436-48. Zabarovic D, Macan D, Vojvodic D. Telescopic crowns as retentive elements of an overdenture on implants in the edentulous mandible: Case report. Acta Stomatol Croat 2008; 42: 98. Li YM, Gao P, Yin K. Clinical effects of occlusal reconstruction on telescopic dentures. Tianjin Yi Yao 2007; 35: 834-6. Weaver JD. Telescopic copings in restorative dentistry. J Prosthet Dent 1989; 61(4): 429-33. Bergman B, Ericson A, Molin M. Long-term clinical results after treatment with conical crown-retained dentures. Int J Prosthodont 1996; 9(6): 533-8. Molin M, Bergman B, Ericson A. A clinical evaluation of conical crown retained dentures. J Prosthet Dent 1993; 70(3): 251-6. Stern N, Zalkind M. Repairing a crown-sleeve coping prosthesis. Part II. J Prosthet Dent 1984; 51(3): 366-8. Yi YJ, Cho LR, Park CJ. Cause of technical failures of conical crown-retained denture (CCRD): A clinical report. J Korean Acad Prosthodont 2003; 41: 714-9. Bayer S, Al-Mansour R, Grüner M, Enkling N, Stark H, Mues S. In-vitro wear simulation of retentive elements for telescopic crowns. ZWR 2008; 117: 412-8. Akagawa Y, Seo T, Ohkawa S, Tsuru H. A new telescopic crown system using a soldered horizontal pin for removable partial dentures. J Prosthet Dent 1993; 69(2): 228-31. Hofmann E, Behr M, Handel G. Frequency and costs of technical failures of clasp- and double crown-retained removable partial dentures. Clin Oral Investig 2002; 6(2): 104-8. Behr M, Kolbeck C, Lang R, Hahnel S, Dirschl L, Handel G. Clinical performance of cements as luting agents for telescopic double crown-retained removable partial and complete overdentures. Int J Prosthodont 2009; 22(5): 479-87. Ericson A, Nilsson B, Bergman B. Clinical results in patients provided with conical crown retained dentures. Int J Prosthodont 1990; 3(6): 513-21. Fernandes V, Chitre V, Aras M. Prosthetic management of a case of advanced periodontitis with telescopic dentures. J Indian Prosthodont Soc 2008; 8: 216-20. Hou GL, Tsai CC, Weisgold AS. Periodontal and prosthetic therapy in severely advanced periodontitis by the use of the crown sleeve coping telescope denture. A longitudinal case report. Aust Dent J 1997; 42(3): 169-74. Weischer T, Mohr C. Implant-supported mandibular telescopic prostheses in oral cancer patients: An up to 9-year retrospective study. Int J Prosthodont 2001; 14(4): 329-34. Weischer T, Schettler D, Mohr C. Implant-supported telescopic restorations in maxillofacial prosthetics. Int J Prosthodont 1997; 10(3): 287-92. Kaufmann R, Friedli M, Hug S, Mericske-Stern R. Removable dentures with implant support in strategic positions followed for up to 8 years. Int J Prosthodont 2009; 22(3): 233-41. Chee W, Jivraj S. Connecting implants to teeth. Br Dent J 2006; 201(10): 629-32. Çelik Güven M, Tuna M, Bozdağ E, Öztürk GN, Bayraktar G. Comparison of retention forces with various fabrication methods and materials in double crowns. J Adv Prosthodont 2017; 9(4): 308-14. Nakagawa S, Torii K, Tanaka M. Effects of taper and space settings of telescopic Ce-TZP/A crowns on retentive force and settling. Dent Mater J 2017; 36(2): 230-5. Wagner C, Stock V, Merk S, et al. Retention load of telescopic crowns with different taper angles between cobalt-chromium and polyetheretherketone made with three different manufacturing processes examined by pull-off test. J Prosthodont [journal on the Internet]. 2016 Apr 1 [cited 2018 Feb 9]. doi: 10.1111/jopr.12482. [Epub ahead of print]. Schwindling FS, Lehmann F, Terebesi S, et al. Electroplated telescopic retainers with zirconia primary crowns: 3-year results from a randomized clinical trial. Clin Oral Investig 2017; 21(9): 2653-60. Schwindling FS, Deisenhofer UK, Séché AC, Lehmann F, Rammelsberg P, Stober T. Randomized trial investigating zirconia electroplated telescopic retainers: Quality of life outcomes. Clin Oral Investig 2017; 21(4): 1157-63. Yunus N, Saub R, Taiyeb Ali TB, Salleh NM, Baig MR. Patient-based and clinical outcomes of implant telescopic attachment-retained mandibular overdentures: A 1-year longitudinal prospective study. Int J Oral Maxillofac Implants 2014; 29(5): 1149-56.